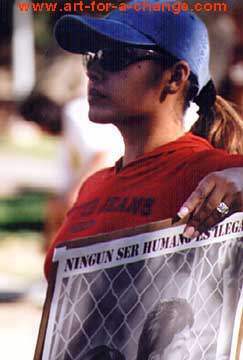 A Chicana carries a Poster during the August 24th, 2002 march commemorating the Chicano Moratorium of 1970. Care, Schools, Jobs, and an end to interventionist wars and Police Brutality. I participated in the march and gave away mulitiple copies of my Poster: "Ningun Ser Humano es Ilegal" (No Human Being is Illegal). In this photograph a young Chicana proudly carries the image down Figueroa Blvd during the march. Angeles Street. For info call: 323-261-2286). The event is free and open to the entire community.